Donald Trump and the Stock Market: Did You Miss These Moves? It was a wild and unexpected week in many ways. Here's a look at some of the craziness that went on within the markets. I've decided that the markets are similar to small children: Just when you believe you have them figured out, they zig when you anticipate a zag. Donald Trump shocked the nation with his surprise victory earlier this week, and Dow futures abruptly dropped roughly 850 points -- more than the drop after the events of 9/11. Then, something crazy happened. That decline abruptly reversed in the morning hours, and throughout the week, enabling the Dow to post its largest weekly gain since 2011. Raise your hand if you saw that coming? Go ahead; I'll wait. While there's a huge amount of uncertainty attached to Trump's upcoming presidency, we should all remember to avoid knee-jerk reactions, because you just never know when the market will zig instead of zag. Sticking with the Trump theme, here are some companies making big headlines or big moves this week. The auto industry can't catch a break this year, with Brexit throwing a curveball in Europe and sales peaking in the U.S. market. Now, Trump has mentioned a couple of strings he might yank that could complicate things for multiple major automakers. Trump mentioned potentially adding tariffs to vehicles exported from Mexico to the U.S., which would make it more expensive for Ford Motor Company (NYSE: F) and General Motors to produce small cars in Mexico and bring them to the states. Some estimate (take it with a grain of salt) that the additional cost could reach $5,000 per vehicle. Despite that negative prediction, automakers largely rebounded this week for one reason: likely relaxed emissions standards. And that left Tesla Motors (NASDAQ:TSLA) in the dust, watching other automakers surge higher. TSLA Price data by YCharts. The story is simple: Trump plans to complete a comprehensive review of all federal regulations, especially the fuel economy and emissions standards. The belief is that the emissions standards, set to require fleets to average 54.5 miles per gallon by 2025, will be relaxed significantly. Tesla's Model S. Image source: Tesla Motors. That would hinder demand for electric vehicles, which Tesla solely focuses on, and enable Detroit automakers to focus more on larger vehicles. "We cannot see this in a positive light for Tesla," said Morgan Stanley's Adam Jonas, speaking in regards to the election results, according to Barron's. "An environment that moves away from incentivizing electric vehicles is clearly adverse to the story." That's also why Fiat Chrysler Automobiles (NYSE:FCAU) jumped the highest this week. It benefited the most since it was drastically behind the industry in terms of developing electric vehicles or hybrids and still heavily relies on Jeep and Ram Truck for profits. I'll refrain from quoting any of Trump's speeches, but it's pretty clear if you heard him over the course of his campaign that defense companies are poised to benefit -- and that was certainly reflected in the markets this week. RTN Price data by YCharts. Morningstar even took a broad brush to its price targets for defense companies: "Our new fair value estimates are as follows: General Dynamics $168 (from $155), Raytheon $151 ($144), L-3 Communications $145 ($138), Northrop Grumman $208 ($192), Lockheed Martin $224 ($221), and Boeing $151 ($145)." Raytheon Company (NYSE:RTN) had an even better week as it secured a contract from the U.S. Air Force to provide vehicles and support equipment for Lot 10 Miniature Air Launched Decoy Jammer, or MALD-J. The contract is valued at just over $76 million. 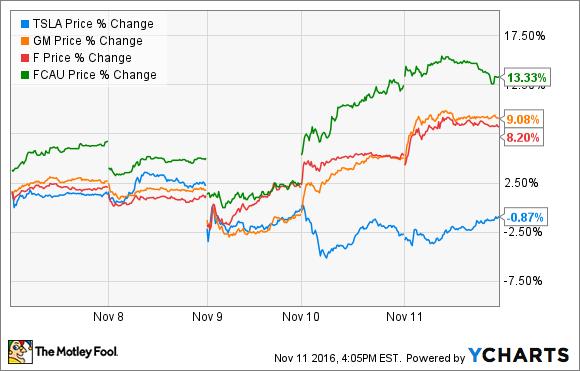 In terms of industrials, Trump's victory was a huge boon for U.S. Concrete (NASDAQ:USCR); its stock price jumped 17% for the week. It's not difficult to understand why, either. U.S. Concrete generates almost 60% of its revenues from selling products in the commercial and industrial construction business, and another 16% from street, highway, and other public projects. Both of those segments stand to benefit from Trump's promised infrastructure spending, especially the latter. Beyond that, it's even more encouraging for investors of U.S. Concrete because the company operates most of its business in critical markets such as New York; New Jersey; Washington, D.C.; Northern California; and Texas. Even better yet, the company's business revolves around selling ready-mix concrete and aggregates to construction companies, so it's a less risky play since the company doesn't have to win contracts to benefit from massive infrastructure spending. 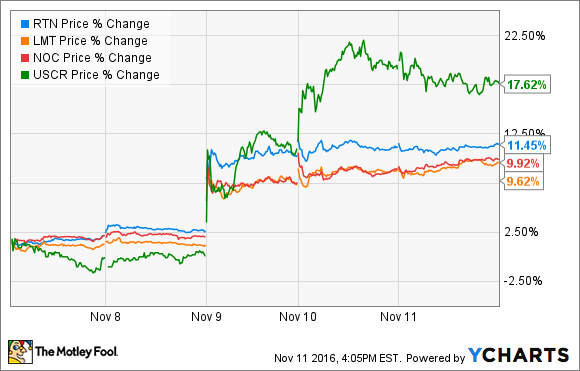 Ultimately, these are just a couple of the sectors that were impacted significantly this week thanks to Trump's surprise victory. But we all need to remember that he doesn't take office until January, and we don't know for sure how quickly his policy changes will happen or how broad they will be.